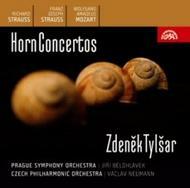 This set of four concertos for French horn and orchestra, magnificently played by longtime horn soloist of the Czech Philharmonic, Zdeněk Tylšar, represents a mere fraction of what this extraordinary, world-class musician has recorded for Supraphon. Mozart’s Concerto in E flat major, K 417 is a proving ground for French horn players, a piece which demands technical brilliance, and Tylšar manages the solo part in grand style. The two concertos by Richard Strauss are the cornerstone of every solo French horn player’s repertoire, and Tylšar’s performance of these concertos was unparalleled in his day. The concerto by Richard Strauss’ father, Franz Joseph Strauss, also provides the soloist with an opportunity to develop his playing technique and tone culture to the fullest. These concertos, recorded in the late 1970’s and early 1980’s when Tylšar was at the peak of his career, were originally released on LPs and have been digitally remastered for CD for the first time ever. They are proof that Zdeněk Tylšar ranks among the world’s French horn elite even today.